Today, January 31st, we show you some pellets on sale at 100 yen a cup in some zones in the Garden. 1월31일 오늘은 온실내의 각 만남의 존에서 한컵에 100엔에 판매하고 있는 사료를 소개드리겠습니다. First, pellets for toucans on sale in the Water Lily Pools Zone. 첫번째것은 수련못존에서 판매되고 있는 토코투칸용펠렛입니다. The pellets are mainly for birds in the first picture, but some parrots and turacos also eat them. Moreover, the pellets are the most compatible food for birds in the Garden, so you can take the cup into other zones. 이 토코투칸용펠렛은 주로 사진중의 새들이 먹는 펠렛인데 앵무새나 투라코도 먹습니다.토코투칸용펠렛은 모든 존에서 쓸수 있는 사료로서 어디에든 갖고 들어갈수 있습니다. Pellets of Mazuri Co. Ltd. are also on sale in the Water Lily Pools Zone, mainly for fishes in the pools. It doesn't harm Sun Conures to feed them with these pellets. 수련못존에서는 마즈리회사에서 만든 펠렛도 판매하고 있습니다.이것은 주로 못안에 있는 물고기들의 먹이인데 태양황금앵무새 등 앵무새류에게 먹여도 됩니다. 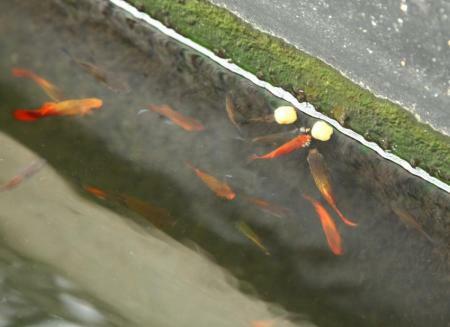 As I threw them into the pool, some platyfishes came at once to eat them. However, tilapias came right after that and ate large part of the pellets. 못에 먹이를 던졌더니 판상물고기가 인츰 모여들었습니다.하지만 인츰 큰 물고기가 와서 절반넘게 훌쩍 먹어버리고 말았습니다. Next one is the pellets for ibis on sale in the Parrots Handling Zone. They are mainly for waders, but peafowls and some other birds also eat them. 다음은 만남의 길에서 팔고 있는 따오기용펠렛입니다.이것은 주로 따오기나 논병아리가 먹는 사료인데 공작새도 먹일수 있습니다. These are only pellets that spoonbills eat. In case of other pellets, they come near to have a look at the cup but they would not eat. At the sight of the pellet, spoonbills cluster around you and take pellets eagerly, it is an exciting sight. 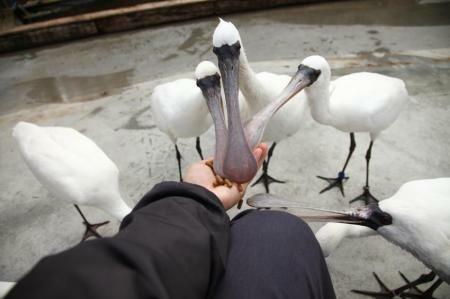 Please feed them with your hand, because bills of spoonbills are so wide that it is impossible to pick up a grain of pellet directly from the cup. 저어새는 이 따오기용펠렛외에는 먹지 않습니다.다른 먹이를 주면 다가와서 보긴 하지만 먹지는 않습니다. 따오기용펠렛을 발견한 순간,저어새들이 욱 몰려왔습니다.주둥이가 넓어서 컵채로 주면 먹지 못하기때문에 펠렛을 손에 놓고 먹이세요. At the Waterfowls Handling Zone where all the birds can eat the pellets for toucans, only pellets for tucans are on sale. 모든 새들이 토코투칸용펠렛을 먹는 물가의 새와의 만남의 존에서는 토코투칸용펠렛 한가지만 판매하고 있습니다. 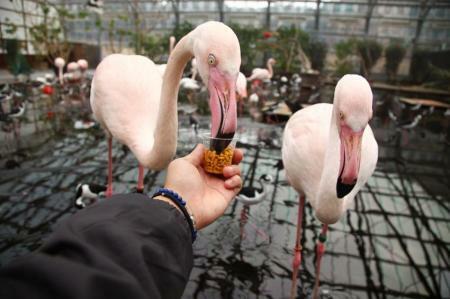 A Greater Flamingo came at the sight of the pellets. 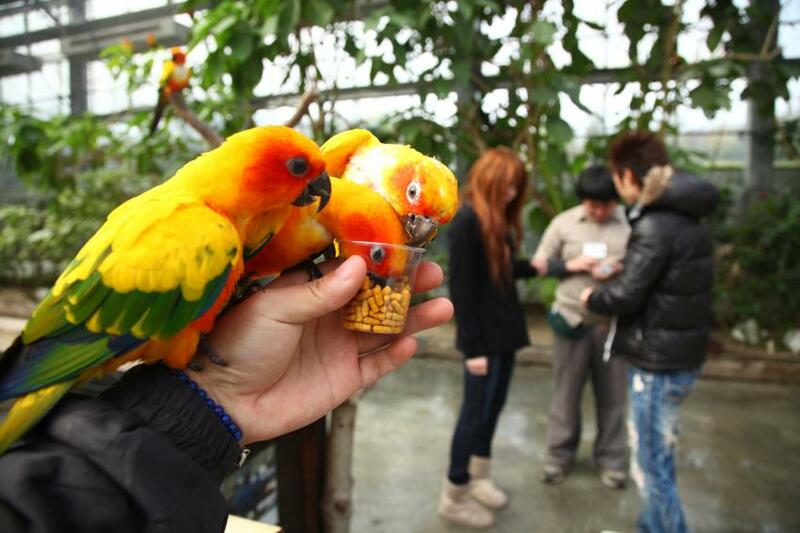 It is fed from the cup in this picture, but you can feed it from your hand as well. Some Toco Toucans may sit on your arm or shoulder for the pellets. 먹이를 보여주자 플러밍고가 한시의 망설임도 없이 바로 달려왔습니다.사진에서는 컵으로 먹이고 있지만 손으로 직접 먹일수도 있습니다.토코투칸도 이 펠렛을 목표로 어깨나 팔에 날아와 앉기도 합니다. Cups of pellets in these pictures are for weekdays. If we sell the same amount of pellets in a cup on holidays when the Garden has more visitors, the birds wll be full immediately. We'd like to apologise in advance that, in order to enable more and more visitors to enjoy handling birds, fewer grains of pellets are in each cup on holidays. 사진속의 펠렛컵은 평일용입니다.많은 손님이 찾아와주시는 휴일에는 같은 량의 먹이를 판매하면 새들이 인츰 배가 불러버립니다.조금이라도 많은 손님이 새와의 만남을 더 즐겁게 보내실수 있게 하기 위해 휴일에는 매 한컵의 펠렛양을 줄이고 있습니다.